An editor is set to leave the weekly newspaper where he has spent his entire career for a new role outside the regional press. Andy Keeble, left, will leave the North Devon Gazette at the end of September after editing the paper for the past six years. Andy has also served as group editor for Archant’s South-West group since March 2017, and has held overall responsibility for the Weston Mercury, North Somerset Times, Exmouth Journal, Sidmouth Herald and Midweek Herald. He will take up a new post as senior PR and social media officer at Children’s Hospice South West, based in North Devon, once he leaves the Barnstaple-based Gazette. The 41-year-old has been with the Gazette since joining as a trainee reporter in 2004, after passing his NCTJ qualifications at City College, in Brighton. The Archant South West group editor job is currently being advertised on HTFP, and can be found here. 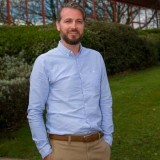 Andy, who is married with two sons aged six and eight, told HTFP: “It’s been a tough decision to leave journalism after 14 years but I’m looking forward to a new challenge and taking up a role that’ll keep me closer to home – and most importantly, my young family. “I’ve thoroughly enjoyed my time at Archant – growing up, I only ever wanted to be a newspaper journalist and the company has given me a career I could have only dreamed of when I walked in the door as a trainee reporter in 2004. Yet another good journalist and editor leaving the company for a job outside the industry, the gene pool of quality editors becomes further watered down. Andy’s steeped in the North Devon Gazette and has done a stirring job there as man and boy leading a tight-knit newsroom team. Again he’s a top-notch editor totally committed to his news patch and his loyal band of readers that Archant can ill afford to lose. But good luck to him going on to project and promote an excellent cause close to a lot of people’s hearts. Sadly, I cannot let this article pass without stating some unpalatable facts. The circulations of some of the papers referred to have fallen dramatically over the past few years, markedly so with the publications produced from the Exeter office with which I am more familiar. Part of the reason for this has been a growing disconnect between these papers and the communities they pre-suppose to serve. I realise I am whistling in the wind but if Archant truly forsees any long-term future for these publications then it is imperative that a Group Editor is appointed with both a depth and breadth of editorial experience who can innovate, inspire and, most importantly, reconnect with those communities who no longer recognise and identify with their local paper as being ‘local’. I realise this will be an unpalatable read for some. All I can add is that I would not write it if I did not believe it. And, of course, I always use my true name. A lot of journos have faced the same tough decision because they once loved the job. But they never regret quitting once they are away from sheer incompetence of some newspaper managements. Leaving for the “dark side”. Surely the real “dark side” is an industry with poor pay, long working hours, poor pensions, the financial exploitation of trainees, no pay rises, ever increasing workloads and mass job cuts, supposedly local papers centrally staffed, planned in Wales, ads designed in India, printed hundreds of miles away etc. He is leaving the dark side, not joining it.